As in prior quarters, net exports have been helping hold up GDP (it is the expenditure category that increased the most in real terms 2009 Q1-Q2). More surprising to me is that defense spending is the second largest increase ... my spending-based forecasting method would not have picked that up. NOTE: Nondefense spending was hardly changed Q1-Q2. I assume that the "stimulus package" did not have a big dose of defense spending, but rather was essentially all nondefense spending. This revises the graph I had in the New York Times Blog section. 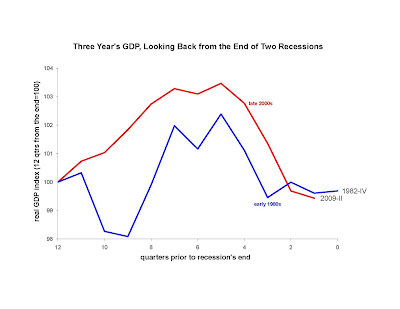 During the three years prior to the end of this recession, three year GDP growth was essentially the same as in 1980-82, but we got there with less depth (ie, more GDP DURING those three years), because the famous early 1980's recession was actually two recessions. Of course, we have to wait to see whether this recession will be followed by a second. My vacation schedule did not permit me to attempt a spending-based real GDP forecast for 2009 Q2, but I did offer one based on productivity: 1.0 percent less than 2009 Q1. I had read that others were more optimistic with spending-based forecasts -- I might have been too I had attempted one. Anyway, the BEA's advance estimate this morning was 0.3 percent lower than Q1. What's important about this is that productivity rose a lot Q1 to Q2 (that's why my productivity approach -- which assumed that productivity would rise, but not so much -- delivered an underestimate). I have sounded this theme for a while now: employment is going down yet productivity is going up. Other's say "Okun's Law is broken." However you label this fact, it is telling us a lot about why we have this recession. "[x] and I have a disagreement that you should be able to settle. I claim that the corporate income tax (a tax on profits) does not result in higher prices since a proportional tax on profits doesn't change the firm's profit maximizing output and hence price. [x] believes that the tax literature indicates that some of the tax is passed on to consumers in terms of higher prices. Who is right?" Tax incidence is a fascinating subject, but (at least the version of it that actually uses economics) is terribly out of fashion, so I cannot cite a credible empirical study that looks for, and finds an effect on prices. In theory, if the corporate tax were really a tax on economic profits, then [y] would be right. But, if the corporate tax were really a tax on economic profits, it would get no revenue! In reality, corporate profits are part of the return on a particular type of capital is not productively organized in some noncorporate way (small business, or nonprofit), or outside of the tax jurisdiction, and cannot be entirely used to collateralize debt. Although I confess that that "particular type" is a bit vague, it's easy to see that some industries ultimately rely on it more than others. This is the mechanism by which the corporate income tax would likely change relative output prices (raising some, and lowering others). For example, the housing and health service industries are organized with little corporate capital. Manufacturing is pretty corporate intensive. So a corporate income tax would raise the price of manufacturing goods relative to housing and health services. The famous Harberger model had this effect. I have written some empirical papers about the effect of corporate income taxes on the after-tax return to capital (not the type of price you were asking about), and believe that the return to capital is essentially unaffected in the medium and long run. The corporate tax does reduce the total amount of capital (that's why its after-tax return is ultimately unaffected), and by this mechanism would reduce wages (and push employment outside of the tax jurisdiction) -- probably the most important price effect of all. Commenters: what do you think? Are there empirical studies of effects on the prices corporations charge to their consumers? Treasury has been working hard this week to expand the number of households that would have no incentive to earn income, urging lenders to modify 500,000 mortgages according to its HASP plan. HASP is the Obama Administrations plan to reduce mortgage payments for people earning less money, and insisting that people making enough to pay their mortgage keep paying in full. Recent reports have shown that housing starts, new home sales and some measures of housing prices have not only stopped their decline, but have improved. Does that mean that the housing recovery has begun? Yesterday's release of the Case-Shiller housing price index may confirm that it has. We have known for a while that the basic supply and demand ingredients would permit a genuine housing recovery this summer. Population has continued to grow more and larger families tend to create more housing demand =97 and housing construction has been practically nothing for the past nine months. Thus, while the housing inventory exceeded the demand in 2007 and 2008, it looked like demand would catch up by this summer. As demand catches up, housing prices should stop falling and stabilize at more normal levels (sorry, we cannot expect to see 2005 housing prices any time soon). Housing construction would proceed at a normal pace, which in 2010 and beyond would keep the supply of housing together with the demands created by population and income growth. Of course, we are in a recession now, and most of us feel that we have less income than we once did. In an earlier post, I showed how this could hold back demand despite the continued population growth, at least if people did not expect their incomes to recover soon. Moreover, some think that banks want to avoid granting mortgages, because those loans caused them so many problems in 2007 and 2008. Without bank lending, housing demand could also be depressed despite continued population growth. Because income and lending factors could offset population growth, it will be comforting to see actual housing data that characterize a recovery: stabilized housing prices, more home sales and a healthy amount of new construction. Housing construction continued to fall this spring far short of what anyone would consider =93normal.=94 But recently we learned that housing starts the beginnings of new home building projects were quite high in June 2009. If those starts are eventually finished, that probably means a more normal pace of construction activity this summer. For several months now, there have been conflicting reports as to housing prices. An often-followed housing price index (calculated by the Federal Housing Finance Agency, or F.H.F.A.) showed prices stabilizing early this spring. In contrast, the Case-Shiller index had suggested that housing prices had been falling as fast as ever. Some have argued that the Case-Shiller index over-weights regions like California, where the housing market has been much worse than typical in most of America, and that the F.H.F.A. index is enough to tell us that housing prices have stabilized in much of America. Nevertheless, it was big news yesterday to learn that the Case-Shiller index showed its first increase since June 2006. December 2008 was a long time ago in the time frame of economic events, but that was when I first said that I "expect to see housing construction resume next summer". I reiterated that prediction at nytimes.com in April. Almost nine months after my prediction, the headlilne today is "New Home Sales Soar in June". "The last time sales rose so dramatically was in December 2000. Sales have risen for three straight months." Supposedly supply and demand are not applicable any more, but I am not aware of any other framework that generated this prediction so far in advance! Recently more economists are noticing that the labor market is getting a disproportionate share of the bad news in this recession. Unemployment is much worse then you'd expect from the GDP growth we've had; GDP growth is much better (less bad) than you'd expect from the unemployment we've had. This is no surprise to readers of this blog. In February 2009 I released a working paper documenting the divergence between GDP and employment, although using real business cycle methodology as opposed to "Okun's law". Since November 2008, I have been saying employment should be especially bad because this recession has especially many government policies that discourage work. Commenters: I would like your input. Would a second stimulus be in the public interest? Why? or Why not? This morning we learned that the OFHEO index rose from April to May (especially in the Pacific region). 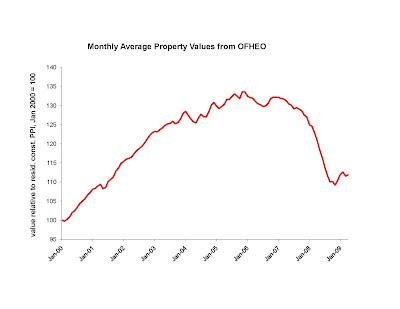 More interesting is that the OFHEO data continue to show that housing price declines stopped sometime in late 2008 or early 2009. Housing construction spending hit new lows in May, though. And the Case-Shiller price index has still yet to confirm what the OFHEO index has been saying for a while. But the June 2009 jump in housing starts may suggest that construction spending and the Case-Shiller price index will also show evidence of a recovery in June or July. Officially known as a “contribution,” the Social Security tax brings in almost as much revenue as the individual income tax, and is catching up. By June 2009, annual revenues for the payroll tax collections had reached almost 90 percent of individual income tax collections. The Social Security part of the payroll tax is about 12 percent of the first $106,800 of employee earnings in a year. The Medicare part is about 3 percent of all payroll earnings (regardless of whether and how much employees make over $106,800). As a result, people earning over $106,800 pay a lesser percentage of their earnings in payroll taxes than do people earning less than $106,800. The highest-earning third of United States households pay more individual income tax than payroll tax. But the other two-thirds are paying more payroll tax than income tax. Higher earners are still responsible for a disproportionate fraction of total taxes, but their share becomes less disproportionate as payroll taxes grow and individual income taxes shrink. In other words, thanks to these revenue trends, an adjustment of relative tax rates for high and low earners may be needed in order to restore the previous amount of fairness (or unfairness) that was present in the overall tax system a few years ago. One approach might be to cut the payroll tax, so its revenues fall in proportion to the loss of individual income tax revenue experienced by the Treasury during this recession. Another approach — which President Bill Clinton used, and which then-candidate Barack Obama discussed during the presidential election — might “uncap” more of the payroll tax. That is, some part (or all) of the Social Security tax rate could apply to incomes over $106,800. The approach in the House’s health care bill seems to be to put individual income tax surcharges on people earning over $250,000 a year. Various groups are opposed to the income tax surcharges, and for some good reasons — the surcharges will harm our economy and may bring little revenue. But opponents to the surcharge will have more political success if they recognize the changing roles of the payroll and income taxes in our economy, and how those changes fuel some of the “populism” in Congress. For a long time, I thought the Federal Reserve was largely independent from the federal government, that it was heavily influenced by the banking industry, and that overall the public was better off from that arrangement, as compared to an arrangement where the Fed was an agency under the direction of the President, or under the direction of Congress. This fall I saw the Fed chairman and Treasury secretary come arm-in-arm to steal $700 billion from the taxpayer, so I am wondering whether my long-time view was incorrect. Yahoo quotes "This was the most positive housing report in ages"
so says a yahoo news report this morning. It seems that June housing starts are well off the 2009 lows, although yet back to where they were last summer. Interestingly, last December I said that housing prices would keep falling until summer 2009, at which time housing construction would resume at more normal rates. I have stuck with the prediction, but have noted that the spring 2009 was quite mixed as to whether a summer rebound would happen. This week I wrote that, to an order of magnitude, the $787 billion spent on the first stimulus amounts to a quarter million dollars per job promised. Econbrowser now claims that this comparison is invalid because, supposedly, it confuses stocks and flows. Suppose that the government passed a law that would spend $1 billion to build 1000 2 bedroom houses in the suburbs. According to Econbrowser, the $1 billion is a flow and the 1000 is stock, so we should not compare them. I say that we have a good sense of what a 2 bedroom house is worth, and paying $1 million each is drastically overpaying. I don't care how long the house lasts! The same goes for judging the value of "job creation." A quarter million (or a million -- that's a more realistic yet still charitable estimate of what the stimulus bill does in terms of job creation) dollars per job is too much to pay for the average job -- I don't care how long it lasts. Let's not forget that jobs require effort and time at work, and those have opportunity costs! Econbrowser does offer another interesting comparison -- the amount the stimulus bill paid per job year created. The Administration claims it is creating or saving 6.8 million job years -- ie, that each person who got one of those jobs it created (or had one of those jobs it saved) would otherwise have been unemployed another two years. We'll break down the absurdity of that another time, but taking them literally means each job year cost over $100,000. This by itself makes the tax system more regressive (less "progressive"). It is possible that some of the individual income tax "surcharges" proposed for the rich would only bring the overall tax system regressivity back to where it was a year or two ago? Today we learn that the CPI in June was 0.7 percent higher than in May. Yesterday it was reported that retail sales were up 0.6 percent, which suggests that the volume of retail sales was essentially constant May-June. ie, the only reason retails had more $ sales is that (on average) they were charging more, not selling more items. The economy has gotten worse than the Obama administration had predicted it would be even if Congress had spent nothing on “fiscal stimulus.” Although some are arguing that this gap is proof that more stimulus is needed, it really shows that the cost of the American Recovery and Reinvestment Act of 2009 — and laws like it — far exceed their benefits in the form of economic stimulus. By June 2009, the unemployment rate had reached 9.5 percent, as compared to the 7.6 percent it was in January 2009 when Congress passed, and President Obama signed, the $787 billion stimulus bill. The Obama administration had predicted that the June 2009 unemployment rate would be less than 8 percent — almost a half of a percentage point bigger than it would have been without a stimulus bill. The Obama team had predicted that the stimulus law’s effect would always be less than two percentage points, even at its peak potency. We cannot blame the Obama administration for failing to predict June’s 9.5 percent unemployment rate. That result just shows the size of the shocks hitting the economy: Even the best forecasters can miss the unemployment rate by almost two percentage points, even when forecasting fewer than six months ahead. Some of us thought that the fiscal stimulus would do essentially nothing to improve the economy. But even stimulus advocates admitted that economic improvements coming from the stimulus law — about a half a percentage point (by their estimates) — would be small when compared to the shocks hitting the economy. Based on this comparison, a few economists have suggested that the stimulus bill should have been larger. Their logic is that a half of a percentage point improvement could have been one percentage point if we have spent twice as much, and two percentage points if we had spent four times as much. An even more massive stimulus, they say, would actually have effects that we could notice, and that we need. But fiscal policy is not merely a dial that can be turned to any desired amount. If it were just a dial, then those of us who thought the stimulus bill would have a tiny effect would be supporting an even larger stimulus than the Obama administration proposed! An impotent fiscal policy dial would have to be turned a lot to have a given effect. This faulty logic comes from ignoring the costs of fiscal stimulus, and failing to ask whether the costs are commensurate with even the most optimistic estimate of the benefits. The Obama administration had said that the stimulus bill would “save or create” 3.5 million jobs while adding $787 billion to the federal budget. Admittedly, some of this money went to taxpayers and to some worthwhile public works, but it also created additional economic burdens in the process of collecting the taxes and issuing the debt to pay for it. To an order of magnitude, the promise of those 3.5 million jobs cost a quarter of a million dollars per job promised. If instead the fiscal stimulus “save or created” just one million jobs, that doesn’t mean that the stimulus should have been 350 percent bigger. Rather, it means that each job promised cost almost $1 million each! Congress needs to ask the stimulus advocates why just one job promised is worth hundreds of thousands of taxpayer dollars, and why they are so sure that the promised jobs will turn into actual ones. Even better, they should consider turning off the first stimulus before more tax dollars are wasted. When it comes to forecasting housing prices, Professor Shiller sees no reason to use the laws of economics. Professor Glaeser toys with the idea of using time series econometrics instead of supply and demand. Since he is a distinguished Chicago alumn, I will assume that his is just an exercise in creative thinking. I hope more economists soon toss the laws of economics, and the free market brand name, because I am trying to buy all of them for myself while everyone else is selling them so cheaply! The House is talking about mandating the purchase of health insurance for employers with aggregate payrolls as small as $250,001 per year. Larry Summers wrote once a nice paper explaining how mandated benefits are not the same as a tax, because the worker gets at least some benefit when his employer purchases employee benefits, whereas all of the benefits from employer tax payments go to the government. Nevertheless, mandating health coverage is in large part a tax, especially for small businesses for whom a large fraction (I would guess about 1/3) of the costs of providing health insurance are insurance administrative (as opposed to obtaining health care, or at least health care administration). If and when such a law goes into effect, a number of employers may want to shrink their payroll to get it small enough to avoid the mandate: perhaps by moving full time workers to part time, or firing some employees. Obviously, big brother will have red tape that is designed to penalize such opportunistic payroll policies. In case the red tape doesn't work, the threat of law suits from affected employees may. So the savvy employer will make these payroll adjustments well before the law is passed and goes into effect. For example, if he thought the law would go into effect in Fall 2009, he might start firing people and moving others to part time in the Fall of 2008. Reuters reports that U.S. officials are thinking about further ways to forgive debts for the unemployed. That's bad news, but at least one of those official partly recognizes that such a policy "could create perverse incentives." Data was also release showing that 185,000 mortgages were modified in 2009 Q1. That's a lot (too many, IMO), although less than the pace the Obama Administration would like see. Seasonally adjsuted retail sales rose in June, but are still lower than they were in February. We'll know more tomorrow (with the CPI report) how much of the retail sales increase was inflation versus higher sales volume. I suspect that it is mostly inflation. Are Animals Telling Us About the Economics of Health Care? Technical progress has made healthcare better (e.g., treating heart disease without surgery) at an especially rapid rate, and this has increased health care demand relative to other goods in the economy. The U.S. has been getting richer (with a hopefully brief and comparatively minor interruption in 2008-9), and health care is a luxury good. Americans are increasingly busy, so they have been substituting health care and related activities from the home to the market. Eg., in the old days maybe mom would have counseled a depressed child, now that child sees a mental health care giver. Medicare and/or private insurance and/or malpractice litigation cause patients and doctors to demand too much health care, because the patients and doctors do have to pay for the health care they receive and give. Of course, Medicare and private insurance have been around for a long time, so this theory is usually tweaked to explain why it has gotten worse. Medicare and/or private insurance have skewed technical progress. Again, because patients and doctors do not pay, they have greater demand for costly new technologies than they do for new technologies that could give the same health care at cheaper cost. Elsewhere in the economy, more of the technical progress goes toward obtaining the same results at lower cost (rather than spending more to get better results). The American Medical Association and other physician groups have blocked the supply of physicians by limiting medical school admissions, preventing nurses from doing some doctors tasks, etc. The federal government has stiffled the supply of physicians by creating the expectation that they will have to pay for part of the next health care reform. Potential medical school enrollees have long recognized this and chose other professions. It is important to know the relative importance of these factors. To the extent that it is (1)-(3), health care spending growth is NOT A PROBLEM, but something to celebrate -- it reflects improvements in our situation. If the government were to reduce health care spending, that would be bad! To the extent that (3)-(6) are to blame, some kind of reform might make things better. Although explanation (5) does imply that the health care industry needs some fixing, it still agrees with (1) that health care has not gotten more expensive -- it has just gotten better. (5) is just saying that, considering the cost, health care has gotten too good. I think (1)-(3), (5) and the main factors. Today Professor Mankiw shows how veterinary spending has increased just like spending on human health care, but Professor Mankiw only hints and the fascinating economics behind that comparison. I do not own a pet, but I am pretty sure that pets are not covered by private insurance or medicare. 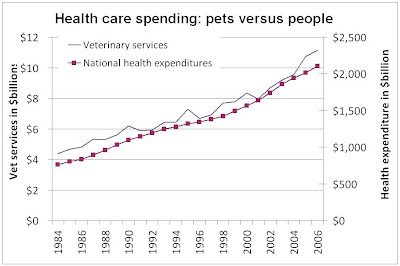 So you cannot blame (4) for the vet services spending growth! Numbers (6) and (7) would seem to make vet services CHEAPER, by pushing some people from being physicians to being vets. (1)-(3) are consistent with the common trend for vet and human health spending. E.g., both pet and human health care may be luxury goods. Busy mom may be at least as willing to shift her pet's care to the market as to shift child's care. I bet a lot of the technical progress seen in vet care has been adopted from the human health industry. This fits with (1), but it also fits with (5). To see this, note that vet spending is 200 times less than human spending. Thus, I bet very few things are invented with the intention that they would ultimately be used on pets (who have no insurance), and then only later is the human applicability of these inventions appreciated. Rather, a health care innovator who is working on something potentially applicable to both humans and pets must realize that 99+% of his profits would come from the human application, and that humans have health insurance. In short, the spillover of human technology to pets fits explanation (5) with the growth of pet spending: HUMAN insurance has distorted innovation away from cost reducing technical progress, even in the pet sector. How long will this list get before more economists recognize that government has done more harm than good during this recession? Yesterday my 18' Hobie SX traversed a 21 nautical mile course in less than three hours. Like me, dozens of sailboat captains hail from Orient, NY, but none of them was able to cross the annual "Spindrift" race's finish line before I did. An out of town boat (a J105 -- about twice as long as mine) crossed 20 seconds before I did, and a 40' boat (a J122 from New Suffolk) beat me by 22 minutes. Although efficiency was not part of the race, I did well in that category: I sailed myself (as compared to five sailing each of the others) and with boat and equipment (no engine or electricity!) that is at an order-of-magnitude cheaper! Obama is a central planner: his teams is trying to guide the U.S. economy to grow the "right" industries, and shrink the "wrong" ones. The economy is going to get worse. How does he know? Maybe he knows of plans to unveil yet more policies that further destroy work incentives, in addition to those unveiled already: like means-tested mortgage modification, mean-tested student loan modification, unemployment insurance extensions, state income tax hikes, and marginal federal tax rate hikes on the "rich"! There has been so much talk of "fiscal stimulus" and ways the government can help, but I think the ultimately the debate about public policy and the 2008-9 economy will be whether the government made things worse, or was just impotent. There are few economists now saying that government caused the housing bubble (quite an exaggeration, I think), but I seem to be the only one saying that, even with a housing crash, the depth of this recession would have been significantly less if the government had not done its damage too. Last week’s disappointing employment report has raised the question of whether the stimulus package is working. Construction data over the last couple of years supports the view that federal spending would never provide much “stimulus,” in part because it was doomed to be ill-timed and ill-targeted. 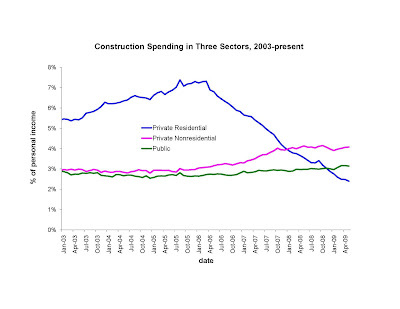 The chart below graphs monthly construction spending, from 2003-2009, for three sectors: private residential, private nonresidential and public (of which residential is negligible). In order to adjust for the inflation and economic trends of the period, each spending series is expressed as a percentage of personal income less transfers. Hindsight shows that housing construction sharply reversed trend in early 2006. Hindsight also shows that the housing boom used up significant numbers of workers and equipment, and the housing crash freed up those resources. That created opportunities for non-residential construction projects in the private and public sectors. Although private construction did not significantly respond to these opportunities during 2006, private non-residential construction ramped up throughout 2007. That private non-residential activity remained high, and perhaps increased further, throughout 2008. Meanwhile, the public sector still kept its construction activity at the low level that prevailed throughout the housing boom. Unlike the private sector, it did essentially nothing to put unemployed workers and equipment to work. In January 2009, Congress passed a stimulus bill that was supposed to put some of the unemployed back to work. But January 2009 was almost three years after the spending opportunity presented itself, and two years after many projects were under way by those in the private sector who saw these opportunities. Moreover, typing and signing a bill is not the same as doing construction work. 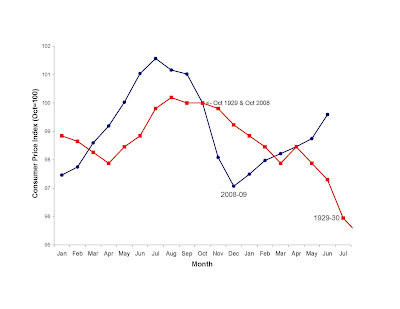 The public construction series shown in the chart goes through May 2009 — four months after the bill became law — and shows only a tiny increase by that time. We are told that we will actually notice stimulus bill spending sometime in 2010. One might argue that the housing crash presented the public sector with little opportunity because residential construction workers and equipment are not useful for the kinds of transportation construction that dominate public construction spending. That is at most partly true, because some housing workers have responded to the housing crash by re-qualifying for highway work. More importantly, that argument (if correct) only provides another reason public spending cannot both put unemployed housing resources back to work and provide value to the public: The housing resources are ill-suited for public sector work. The public sector — especially at the federal level — is not known for its agile and effective responses to market conditions. In authoring the stimulus bill, Congress and the president relied too much on federal spending and too little on the private sector. 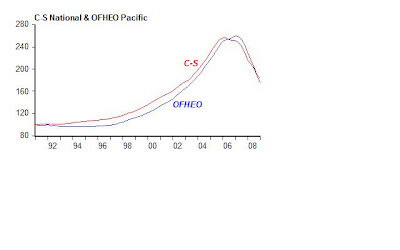 Professor Nunes sent me this chart comparing the Case-Shiller national housing price index with the OFHEO index for the Pacific region only. The close correlation between the two is consistent with the hypothesis of Rebecca Wilder that the "national" Case-Shiller index does not represent well the nation as a whole. I applaud Rebecca Wilder for doing some hard work. I have not yet studied the details, but she seems to be saying that some of the Western cities are getting too much weight in the Case-Shiller index, and as a result the OFHEO index is giving a more accurate picture. That agrees with my rough impression. If we are right, housing prices suggest that the housing market has bottomed, although construction spending is not yet supporting that conclusion. Can Unemployment be Blamed for the Foreclosure Crisis? Unemployment and foreclosure rates have skyrocketed over the last 1-2 years. The regions experiencing the most unemployment seem also to be the ones that have the highest foreclosure rates. Both economic theory and data suggest that unemployment by itself cannot create much foreclosure. Negative home equity -- having the mortgage "under water" as they say -- causes foreclosures. Theory: a homeowner always has the option to stop paying his mortgage. Although state laws are somewhat different, to a good approximation the worst case scenario for a homeowner who stops paying is that he can no longer own or occupy the house, and may suffer a reduction in his credit rating that might raise his costs of future borrowing. But if the combined present value of these costs were less than the present value of his promised mortgage payments, he can do better than paying in full. That’s probably an important reason why, as of early 2009, more than five million homes were already either in foreclosure or their owners were delinquent on their mortgage payments. “Inability to pay” is probably not enough by itself to create a foreclosure, because a homeowner unable to pay but with positive home equity may want to sell his home to pay the loan (and thereby retain his home equity) rather than invite foreclosure. Conversely, a person who is quite able to pay might rationally invite foreclosure, for the reason cited in the text above. Liebowitz (2009) finds that negative equity was a much more important factor than unemployment in causing the foreclosures that occurred in the second half of 2008. With that said, unemployment probably magnifies the effect of negative equity. If everyone had remained employed, and falling housing prices were all that had happened, then lenders would probably work out a deal with their borrowers so that their negative equity was brought back closer to zero, which would prevent the borrowers from seeing foreclosure as their best option. But when some people are unemployed and others are not, lenders will make more (lose less) by discriminating among borrowers: likely foreclosing on those in the most financial trouble, working out a deal with those with mediocre incomes, and demanding full payment from those most able to pay. As I have pointed out, this rational discrimination among borrowers also raises the unemployment rate, so foreclosures may have a bigger an effect on unemployment than unemployment has on foreclosures. Right now the unemployment rate is 9.5 percent. The administration had said that, thanks to their fiscal stimulus, it would be less than 8 percent. I don't blame them for missing a forecast. Forecasting is difficult. And this labor market has been surprisingly bad. I do blame them for misleading the public by saying that the stimulus package would improve the unemployment rate (relative to whatever admittedly unpredictable outcome it would have been without stimulus). They claimed that, by June, the unemployment rate would be improved by almost 0.5 percentage points. That clearly has not happened. Although we did not know the future of the economy, we knew the stimulus package wouldn't help. in May 2009. Pretty much the pattern has been: job losses are primarily male, so male employment is falling towards female employment. Employment is still falling pretty sharply. While GDP has hardly surprised me, I did not anticipate last fall that employment would get so low. Even with the benefit of hindsight, I am not sure I see a complete explanation. But likely there is more to the story: too bad I don't know more than that. Today the Census Bureau revised its estimates of construction spending January 2007-April 2009. 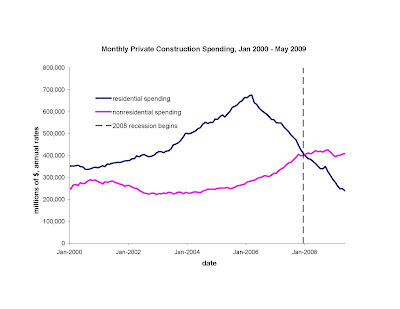 The revision says that more of the INCREASE in non-residential construction spending occurred during 2007 than occurred in 2008 (to see the time series prior to the revision, see here). Still, non-residential construction is higher now than it was when the recession began. Today the Census Bureau also released an estimate of May 2009 construction spending. Residential spending continued to fall. Private non-residential spending increased, but little. I have noted that construction could bottom out and recover without a rise in private construction, because the private activity would be crowded out by public spending. However, the public spending fell too. Housing prices would likely stop falling, and begin to rise, before construction spending recovered because prices can adjust more quickly. Nevertheless, a housing recovery cannot be declared until residential construction spending stops falling. The easy monetary policy at the end of 2008 has set up our economy for inflation, but the timing depends in part on how investors behave. Last week I showed how the Federal Reserve dramatically expanded the monetary base (that is, the value of currency, coin and Federal Reserve deposits) at the end of 2008, and how nothing like this occurred during the onset of the Great Depression of the 1930s. Still, even though monetary policy is so different in this recession as compared with the policies of the 1930s, inflation has not yet been very different. During most of our lifetimes, there has been inflation: The prices of things we buy have generally increased over time. Only on rare occasions have consumer price trends suddenly changed directions. One of those occasions was 1929. Consumer prices were pretty constant in the 1920s. The chart below picks up the story in January 1929 with the red line. That line measures the (seasonally unadjusted) consumer price index in each month through July 1930, normalized so that October 1929 is 100 (for example, the value of 97.9 in April 1929 means that prices then were 2.1 percent lower than they would be in October). In the fall of 1929, the inflation stopped (incidentally, the stock market crashed in late October of that year) and prices headed down, falling almost every month for almost four years. For the first 15 months or so of this recession, consumer prices have followed a similar pattern. 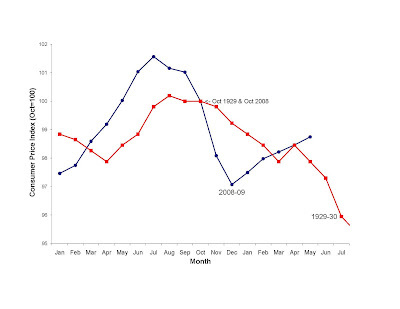 The blue series in the chart shows the consumer price index for 2008 and 2009. Like the 1929 series, the 2008 series is normalized so that October is 100. 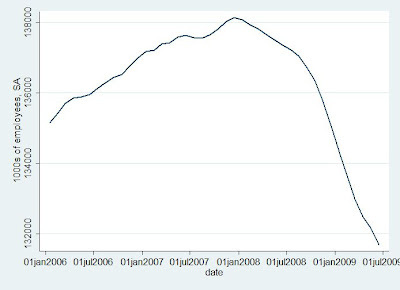 The chart shows how consumer prices also rose in the spring and early summer of 2008. Inflation had stopped by the fall (there was a stock market crash in October 2008, too), and consumer prices headed down. In fact, the deflation at the end of 2008 brought prices down more than 4 percent in a couple of months, as compared with a 1 percent drop at the end of 1929. The actions of the Federal Reserve and its chairman Ben S. Bernanke guarantee that we will not experience a four-year deflation like that of the Great Depression. But investor sentiment is an important reason why the short-run inflation patterns have been similar in 2008-’09 to what they were in 1929-’30. During both episodes, investors had a sudden reduction in their willingness to hold private sector debt and equity and to purchase goods, and a sudden increase in their desire to hold “quality” assets like Treasury bills. An increase in Treasury bill prices is one way markets adjust to this change in demand — and we saw this in September through December of last year — but another market adjustment is for the prices of goods, equities, and private sector debt to fall (or rise less than they would have) as investors pull their money out of these categories. Deflation is, by definition, a drop in goods prices. Part of the next inflation may be the reverse of this process: Investors suddenly shift their demands from “quality” assets back to equities, private sector debt and goods. As some of the commenters explained last week, a sudden investor shift like this will be associated with a sharp reduction in the value of the dollar. If I could predict exactly when investor demands will shift away from “quality” assets, both I and the readers of this blog might get as rich as the billionaire financier Warren E. Buffett. But recognizing the role of investor sentiment at least helps us appreciate why the timing of the next inflation is so uncertain.